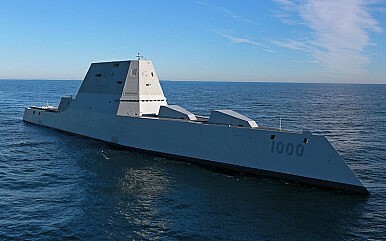 The U.S. Navy’s most technologically advanced destroyer has suffered an engineering casualty. “Vice Adm. Nora Tyson, commander, U.S. Third Fleet, has directed USS Zumwalt (DDG 1000) to remain at ex-Naval Station Rodman in Panama to address engineering issues that occurred while transiting the Panama Canal,” the U.S. Navy statement reads. Engineering casualties are not uncommon for lead vessels of a new class of warships. The USS Zumwalt had previously sustained an engineering casualty during preparation for at-sea trials in September. Seawater leaked in the propulsion motor drive lube oil auxiliary system for one of the Zumwalt’s shafts. Repairs took about two weeks (See: “US Navy’s New Stealth Destroyer Suffers Engineering Casualty”). The new warship, featuring a wave-piercing tumblehome hull and stealth design, was commissioned into active service last month. Once in San Diego, the destroyer’s combat systems will be installed and extensively tested. As I reported in early November (See: “US Navy’s Most Advanced Stealth Warship Has no Bullets for its Big Guns”), the U.S. Navy will likely cancel the primary projectile for the two big guns of the warship due to excessive costs. Unfortunately, the Long Range Land Attack Projectile (LRLAP) is the only munition designed to be fired by the ship’s two 155 millimeter/62-caliber Advanced Gun Systems (AGS). “The reason for the likely cancellation of the LRLAP order is the steady rise of the per unit costs of the projectile as the number of Zumwalt-class destroyers was cut from 28 to just three… The price for one LRLAP projectile is around $800,000 or more,” I explained. Once in service, the ship will be one of the most heavily armed destroyers in the U.S. Navy’s history. “The destroyer is equipped with a so-called Peripheral Vertical Launch System with eighty MK57 vertical launch tubes, which can accommodate one to four missiles depending on their size, and is armed with a wide range of weapon systems including Tomahawk missiles, torpedoes, and anti-submarine rockets,” I reported elsewhere. Following the weapon activation period in San Diego, the ship is slated to join the U.S. Navy’s surface fleet at an unspecified date 2018. The U.S. Navy’s newest destroyer was commissioned on October 15.